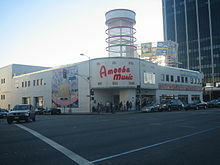 Amoeba Music is a US independent music chain with stores in Berkeley, San Francisco, and Hollywood, Los Angeles, California. It was founded in 1990 in San Francisco's Haight-Ashbury district and remains in operation, having survived the decline of CD sales in the 2000s. Founded by former employees of nearby Rasputin Records, it opened on Telegraph Avenue in Berkeley in 1990. The stores are unusually large given their independent status. The San Francisco store, which opened in 1997 in the Haight-Ashbury district close to Golden Gate Park, is especially notable for its size, occupying a 24,000 square foot (2,200 m²) former bowling alley. It regularly stocks upwards of 100,000 CDs, vinyl records, and audio cassettes, both new and used. It is still operating as of 2019, having survived the decline in CD sales since the early 2000s thanks to its thriving trade in used vinyl records. The Southern California location was added on November 17, 2001 when the store opened a new branch on Sunset Boulevard (at Cahuenga Boulevard) in Hollywood. At the time of its opening, the store planned to stock as many as 250,000 titles, which would have placed it among the largest independent music stores in the world. According to Los Angeles Times writer Michael Hiltzik, the location "instantly became a Hollywood landmark." Documents published by the Los Angeles Department of Planning in August 2017 indicate that the site will be demolished and replaced by a 28-story contemporary glass-and-steel tower with 232 residential units (including ten units for very low-income residents) and 7,000 square feet of ground-level commercial space. Should the City approve the project, it was expected that construction would begin in mid-2019, and be completed in 2021. Amoeba's world music department was headed by Robert Leaver, co-founder of the Round World Music record shop and label in San Francisco. He also worked as a buyer of international records for Amoeba's Berkeley location. The stores also trade in movies, though secondarily to their music business. Each location has a smaller collection of movies on DVD, VHS, Laserdisc and Blu-ray Disc. In addition, each store maintains a selection of music-related posters and artwork for purchase, as well as Amoeba-branded merchandise. The Hollywood location has the entire 2nd floor dedicated to DVD and Blu-ray Disc. In addition, Amoeba Music frequently holds free shows during store hours with locally and nationally known artists from a wide variety of genres. This store was included as a playable venue in the 2008 music game Guitar Hero World Tour. Paul McCartney recorded his EP Amoeba's Secret at an unannounced live performance at the Hollywood location on 27 June 2007. Wikimedia Commons has media related to Amoeba Music. ^ a b c Kukura, Joe (2017-11-17). "Amoeba Music Records 20 Years On Haight Street". SF Weekly. Retrieved 2017-11-20. ^ a b Sharp, Steven (August 7, 2017). "28-Story Tower Would Replace Hollywood's Amoeba Music". Urbanize Los Angeles. Retrieved 28 February 2019. ^ Good CD, Shame About the Cover. Los Angeles Times. Retrieved November 27, 2018. ^ Round World at a Crosswoads. SFGate. Retrieved November 26, 2018. ^ "Amoeba Music - What's In My Bag". www.amoeba.com. Retrieved 2016-04-07. Hermes, Will (February 19, 1998). "The World's Greatest Record Store?". Rolling Stone (780). pp. 19–20. Diehl, Matt; Eliscu, Jenny (August 12, 2003). "Indie Chains Are Slump Proof: California's Amoeba and other retailers succeed amid industry nightmare". rollingstone.com. Archived from the original on 2008-01-07. Retrieved 28 November 2005. "S.F. Music Landmark Headed to Sunset - Brief Article". (November 13, 2000.) Christopher Keough. Los Angeles Business Journal. Retrieved 2005-11-28. "Golden State: Record Chain Bets on the Past, Future". (November 17, 2005.) Michael Hiltzik. Los Angeles Times (and accompanying Golden State Blog.). "Amoeba Music's Simple Formula". (February 17, 2005). BusinessWeek.